Graphene has established itself as a wonder material once again. An international research team headed by Professor Fritz Aumayr from the Institute of Applied Physics at TU Wien has demonstrated that the electrons in graphene are very mobile and react very rapidly. Impacting xenon ions with a particularly high electric charge on a graphene film causes a huge quantity of electrons to be ripped away from the graphene in a very precise spot. However, the material was able to replace the electrons within a few femtoseconds. This caused very high currents, which would not be maintained under regular circumstances. Graphene’s unusual electronic properties make it a highly promising candidate for future applications in the electronics sector. The Helmholtz-Center Dresden-Rossendorf and the University of Duisburg-Essen took part in the experiment along with TU Wien. The international team got theoretical support from Paris and San Sebastian as well as from internal staff of the Institute of Theoretical Physics at TU Wien. We work with extremely highly-charged xenon ions.Up to 35 electrons are removed from the xenon atoms, meaning the atoms have a high positive electric charge. These ions are then fired at a free-standing single layer of graphene, which is held between microscopically small brackets. The xenon ion penetrates the graphene film, thereby knocking a carbon atom out of the graphene - but that has very little effect, as the gap that has opened up in the graphene is then refilled with another carbon atom. For us, what is much more interesting is how the electrical field of the highly charged ion affects the electrons in the graphene film. This occurs even before the highly charged xenon ion makes contact with the graphene film. As the highly charged ion is approaching it begins ripping electrons away from the graphene due to its very strong electric field. By the time the ion has completely passed through the graphene layer, it has a positive charge of below 10, compared to over 30 when it began. The ion is able to extract over 20 electrons from a miniature area of the graphene film. This indicates that electrons are currently missing from the graphene layer, so the carbon atoms encircling the point of impact of the xenon ions are positively charged. "What you would expect to happen now is for these positively charged carbon ions to repel one another, flying off in what is called a Coulomb explosion and leaving a large gap in the material," says Richard Wilhelm from the Helmholtz-Center Dresden-Rossendorf, who at present works at TU Wien as a postdoctoral assistant. "But astoundingly, that is not the case. The positive charge in the graphene is neutralized almost instantaneously." This could be achieved only possible because an adequate number of electrons can be replaced in the graphene within a very short time frame of many femtoseconds (quadrillionths of a second). The electronic response of the material to the disruption caused by the xenon ion is extremely rapid. Strong currents from neighboring regions of the graphene film promptly resupply electrons before an explosion is caused by the positive charges repelling one anotherThe current density is around 1000 times higher than that which would lead to the destruction of the material under normal circumstances - but over these distances and time scales, graphene can withstand such extreme currents without suffering any damage. 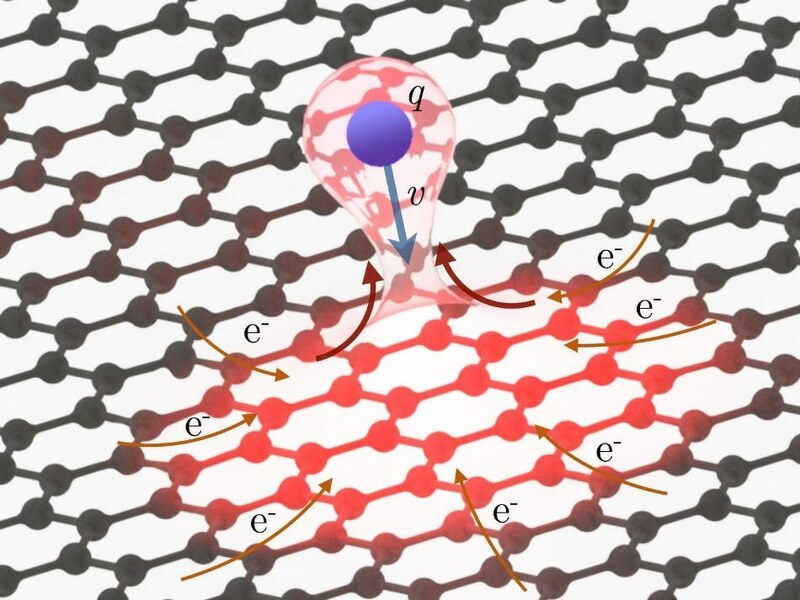 This very high electron mobility in graphene is of great importance for many potential applications: 'The hope is that for this very reason, it will be possible to use graphene to build ultra-fast electronics. Graphene also appears to be excellently suited for use in optics, for example in connecting optical and electronic components,' says Aumayr.